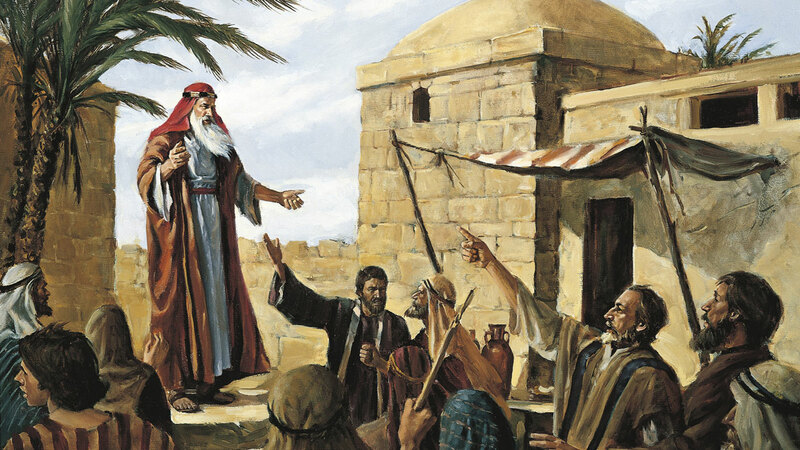 Who Were the “Many Prophets” in Jerusalem During Lehi’s Time? Nephi stated that at the time he lived in Jerusalem, there were “many prophets, prophesying unto the people that they must repent, or the great city Jerusalem must be destroyed” (1 Nephi 1:4). Nine prophets from the Bible were active during the late-7th/early-6th centuries bc,1 a remarkably high number. In addition, other unnamed prophets may have been active during this time as well (see Jeremiah 25:4; 2 Chronicles 36:15–16). Welch has also noted that “such circumstances as trouble in the land ... often precipitated prophetic action in the ancient world.”4 Judah’s troubles with an ever-strengthening Egypt, on one hand, and the impending destruction of Jerusalem at the hands of Babylon on the other, certainly made this era a time of trouble in the land. Considering both this trouble and the coronation of King Zedekiah, it is not surprising that there were “many prophets” in the land during this time. One example of such conflicts was recorded by Jeremiah during Zedekiah’s reign, where he and Hananiah presented competing prophecies before a conference in Jerusalem (see Jeremiah 27–28).7 According to Spackman, this is “when the prophetic conflict reached a climax.”8 With this in mind, one should not be surprised to see a rift between Laman and Lemuel, who took Hananiah’s view that Jerusalem would be spared, and Nephi and Lehi, who preached, like Jeremiah, that Jerusalem would be destroyed. The fact that God raised up “many prophets” during the time of Lehi teaches an important lesson for today. Just as God raised up many prophets in Lehi’s day, God has also raised up many prophets, the quorum of the twelve and the first presidency, to help us today. These prophets help us navigate periods of chaos and transition, just as they did in Lehi’s time. The prophets in Lehi’s time preached that the people must repent or be destroyed, and our prophets today preach repentance and warn us of the consequences of not doing so. The calamities that befell the people of Judah when they failed to listen to these prophets are a reminder of how important it is to listen to the prophets today. Finally, the false prophets of Lehi’s day who caused factions among the people are a reminder of the false voices we hear today.9 These people seek to spread misinformation that creates factions and schisms in society. Just as in Lehi’s time, it is important for us to remember to listen to the fifteen men God has called as prophets, seers, and revelators, rather than being drawn away by the deceptive influences that we read and hear so often in the world around us. John W. Welch, “The Calling of Lehi as a Prophet in the World of Jerusalem,” in Glimpses of Lehi’s Jerusalem, ed. John W. Welch, David Rolph Seely, and Jo Ann H. Seely (Provo, UT: FARMS, 2004), 421–448. David Rolph Seely and Robert D. Hunt, “Dramatis Personae: The World of Lehi (ca. 700–562 B.C. ),” in Glimpses of Lehi’s Jerusalem, ed. John W. Welch, David Rolph Seely, and Jo Ann H. Seely (Provo, UT: FARMS, 2004), 41–64. 1. Table based on Seely and Hunt, “Dramatis Personae: The World of Lehi (ca. 700–562 B.C. ),” 52–54; alternative dating for Habakkuk from John W. Welch, “The Calling of Lehi as a Prophet in the World of Jerusalem,” in Glimpses of Lehi’s Jerusalem, ed. John W. Welch, David Rolph Seely, and Jo Ann H. Seely (Provo, UT: FARMS, 2004), 424. Dating of Obadiah from Paul R. Raabe, Obadiah: A New Translation with Introduction and Commentary, Anchor Bible Commentary, Volume 24D (New York, NY: Doubleday, 1996), 51–53. 2. Welch, “The Calling of Lehi,” 423. 3. Welch, “The Calling of Lehi,” 422–423. 4. Welch, “The Calling of Lehi,” 422–423. 5. Schade, “The Kingdom of Judah: Politics, Prophets, and Scribes in the Late Preexilic Period,” in Glimpses of Lehi’s Jerusalem, 310. 6. Randall P. Spackman, “Was Jeremiah Imprisoned in Zedekiah’s Reign?” part of A Source Book for Book of Mormon Chronology (self-published online, 2010–2012), 2, emphasis added; online (accessed December 20, 2012). 7. Note that Jeremiah 27:1 is a chronological error. Jeremiah 27:3, 12 confirm that these events are taking place in Zedekiah’s reign, as does Jeremiah 28:1, which continues the same narrative started in Jeremiah 27. 8. Spackman, “Was Jeremiah Imprisoned?” 2. 9. See M. Russell Ballard, “Beware of False Prophets and False Teachers,” Ensign, November 1999, online at lds.org.